Talk to any golfer. Seriously. Go ahead and do it. You’ll realize that one of the most important items in a golfer’s bag are divot repair tools, an essential for green walking, putting, driving and cussing at the wind for blowing your ball into the sand trap. The thing is not many might even know that many golf country clubs will practically expect you to have some divot repair tools (or else they’ll just either sell you some, or give you some to use), and for good reason. What Is a “Divot” Anyway? 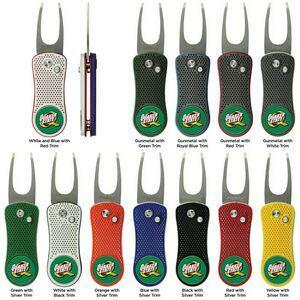 And Why Do You Need a Divot Repair Tool? A “divot” is that break in the grass occurring after a golfer swings at the ball and cuts a portion of the green into a divot. You see it all the time when a golfer kicks up the dirt from driving a ball down the fairway. It causes the green to look, well, not green. Not fun. Plus it takes a real long time for the green to grow back like it should. It’s not the golfer’s fault, obviously. The clubs are designed in such a way that when you swing and hit that ball, you’ll undoubtedly always catch some of the grass and cut it up. Believe it or not, though, there’s a way to replace it, and that’s where the divot repair tool comes in. It takes a lot of work for any golf country club to maintain the greens of a course spanning miles and miles of ponds, sand, turf, and long grass. So it’s customary that a true golfer, a professional golfer, always repairs the divots with precision. The point of this is, if you and your colleagues or employees play golf as a way to take a load off of the workday, be a pal CEO and always give the best gifts for those golfers: custom divot repair tools! A maniac golfer aficionado would appreciate that a bunch. And the best part? That custom divot repair tool has the business name right on it. Instant marketing. Instant reputation. The country club ends up loving not just you, but your business. And your employees will appreciate it. So What Are You Waiting For? Sign Up RIGHT NOW. BRAVA Marketing has it all for you. Simply check out our selections right here, and then contact us right away. Call it our way of teeing off and scoring an eagle on your behalf.